An extra storage space in any room is always welcome, even in a bathroom, where towels, toiletries and other items are accumulated and what better way to keep them organized and always at hand. We show some proposals on how to save space in modern bathrooms, especially taking into account new trends and limited surfaces which have many properties in which each square meter is valued the most. We can gain more storage space with elements that add a touch of design to the atmosphere of the room, at the same time allow us to sort it and highlight its beauty. A shelf or shelves are some parts that can easily be integrated into the environment, firstly because we can choose an order, adapting to the most difficult corners of leverage with other furniture. They also offer multiple decorative options, are found in materials and different sizes, you can make different combinations, it is even possible to install original form. A rack and hanging chains, one glass, some recycled shutters, and many more options can be adapted to these environments to add space and surface of warehouse. 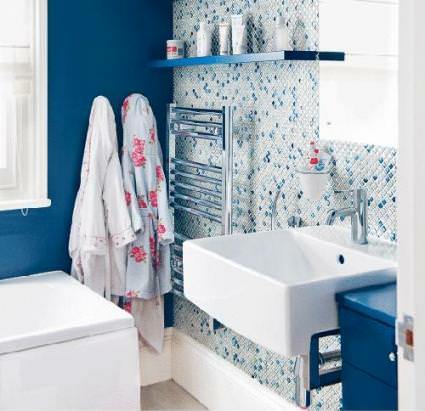 For small bathrooms a good idea is to avoid furniture that overwhelm the environment, and although a vanity unit is the more conventional option may be more convenient to add visually lighter furniture and accessories. An inspiring example: a wooden shelf on which supports a basin floor, and a bench under the same rack complete with a wink of style an ideal set to keep accessories.